Giving USA, the longest-running and most comprehensive report on philanthropy, released its latest numbers today. Published by the Giving USA Foundation and researched by Indiana University’s Lilly Family School of Philanthropy, the study provides insight into the state of America’s charitable giving practices across all charitable sectors and serves as the foundation for much of the research behind Lake Institute’s own training. Giving to religion (defined as giving specific to congregations, denominations, missionary societies, and religious media) has consistently remained America’s single largest recipient of charitable giving. That continues to remain the case. Giving to religion in 2016 increased 3.0 percent (1.8 percent adjusted for inflation) receiving an estimated $122.94 billion in contributions across all faith traditions. This remains 32 percent of all U.S. charitable giving and still twice as much as the next biggest sector (education at 15.3 percent). While this small but steady growth remains relatively unchanged from the past few years, the steady growth is noteworthy. Despite decreasing attendance patterns and rising religious disaffiliation, religious giving continues to hold its own. These trends demonstrate the powerful pull that religious beliefs and practices play on individuals’ giving and the influence that religious organizations continue to play in the larger charitable sector. Giving in 2016 demonstrated growth across the board with all nine major types of charitable organizations increasing, making 2016 just the sixth time in the past 40 years that this has occurred. While giving to education saw slower growth than in years past, other sectors like environment and animal charities; arts, culture, and humanities organizations; health causes; and international affairs nonprofits received a steady boost. All grew faster than religion, so while religion continues to hold its own as the largest subsector, it also continues to lag behind the growth of other sectors. By far the largest percentage of giving and growth came from individuals (3.9 percent growth for a total of $281.86 billion). Only giving by bequest saw a significant decline (9.0 percent). Overall, the numbers point to a slowdown in receipts of many of the largest Christian denominations, but it helps to look deeper into the numbers. Beyond simply how much, reflecting on how money is given to religious organizations is important. Religious donors are showing preferences between undesignated and designated funds, capital and mission/benevolence giving, as well as short-term initiatives or long-term programs. Development staff and religious institutional leaders are also seeking out particular types of donations for various initiatives in order to make their budgets. Even as donors give for many reasons, they also give to multiple purposes, and religious institutions must reflect on how to operate with the restrictions and priorities on the resources they are receiving. Future editions of Insights will hope to dig into some of the distinctive stories in religious giving over the last year and what it might mean for future directions in faith-based fundraising. The good news is that giving to religious organizations remains steady – always changing amidst continued challenges – but vibrant just like the American religious landscape. John L. Ronsvalle and Sylvia Ronsvalle, “The State of Church Giving through 2014: Speaking Truth to Power” (Champaign, Illinois: empty tomb, inc., 2016), 30. Office of the General Assembly, “Summaries of Statistics–Comparative Summaries” (Presbyterian Church USA, n.d.). “Presbyterian Church in America Five-Year Summary,” Presbyterian Church in America, n.d.
 John L. Ronsvalle and Sylvia Ronsvalle, “The State of Church Giving through 2014: Speaking Truth to Power” (Champaign, Illinois: empty tomb, inc., 2016), 189; Total giving is calculated by combining “congregational finances” with “benevolences;” “ACP (Annual Church Profile: Churches up in 2016; baptisms, membership decline) Baptist Press. David Briggs, “Fewer Cheerful Givers: The Financial Crisis Facing U.S. Churches,” The Association of Religion Data Archives, (November 6, 2015). Charles E. Zech and Thomas P. Gaunt, Catholic Parishes of the 21st Century: The Challenges of Mobility, Diversity, and Reconfiguration (Oxford University Press, 2017), 76. Philanthropy Panel Study fielded in 2013 asking about giving in 2012. Steven M. Cohen and J. Shawn Landres, “Connected to Give Synagogues and Movements: Findings Form the National Study of American Jewish Giving” (Los Angeles: Jumpstart, 2014). Ihsan Bagby, “The American Mosque 2011: Basic Characteristics of the American Mosque; Attitudes of Mosque Leaders,” US Mosque Study, 2011. Brian Kluth, “State of the Plate,” Tithe.ly, (2016). “Ideas for Religious Congregations,” Giving Tuesday: The Complete Toolkit, accessed February 13, 2017. Join the conversation! There are mutliple opportunities for in-depth presentaions on Giving USA findings, as well as a chance to ask the researchers questions. 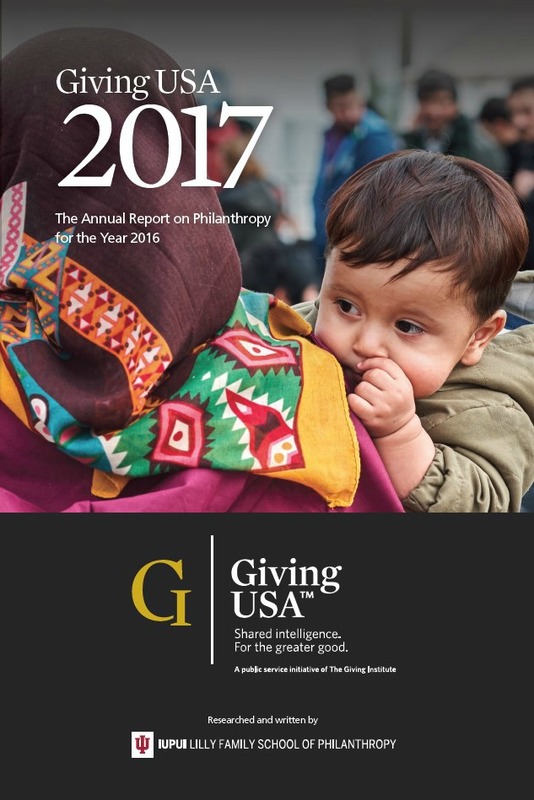 Purchase the Giving USA 2017: The Annual Report on Philanthropy for the Year 2016. Options include paperback book, digital package, powerpoint, data tables, and free highlights. 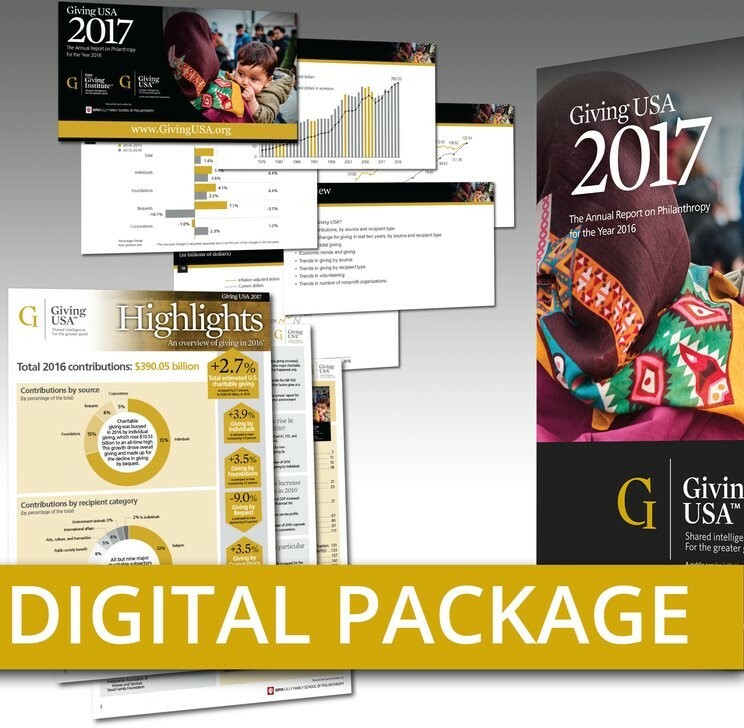 For over 60 years, Giving USA: The Annual Report on Philanthropy in America, has provided comprehensive charitable giving data that are relied on by donors, fundraisers and nonprofit leaders. The research in this annual report estimates all giving to charitable organizations across the United States. Giving USA is a public outreach initiative of Giving USA FoundationTM and is researched and written by the Indiana University Lilly Family School of Philanthropy.